Dr. Ovie Soto, MfA SD senior associate, works with a guest teacher at the MfA SD Summer Institute’s Visitors Day, July 9. “In other professional development programs, they teach us how to teach. In this one, they teach us how to teach math,” noted one teacher at a recent Math for America San Diego summer institute. Math for America San Diego (MfA SD), a national mathematics fellowship and teacher professional development program housed in CREATE, held three summer institutes focused on helping local teachers learn how to implement the Common Core State Standards Mathematics (CCSS-M) into middle and high school mathematics classes. Starting this fall, math teachers in California will be required to integrate the CCSS-M eight mathematical practices into their math instruction. The summer institutes, developed by Harel, provide an atmosphere where teachers work individually and together on rich mathematical problems. They experience a process in which they learn that decisions about pedagogical approach and “teaching moves” come out of a deep understanding of the mathematics content and the students’ thinking. “We’re pleased to be recognized as a leading resource for high quality, effective mathematics professional development for teachers in our region,” added Harel. Dr. Guershon Harel with 2014 MfA SD Summer Institute teachers. 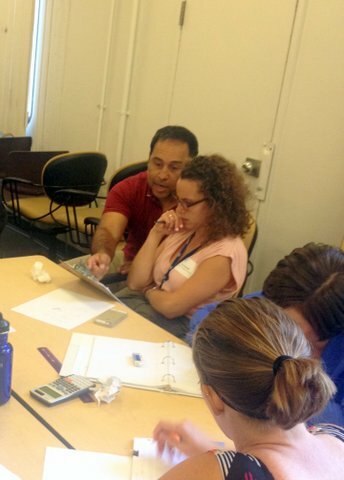 In mid-June, math teachers from area middle and high schools attended a one-week summer institute centered on algebra and integrated mathematics. Teachers also had an opportunity to attend a two-day curriculum review led by Soto and MfA SD Mentor Fellow Tina Shinsato, a mathematics teacher at Rancho Buena Vista High School in Vista. 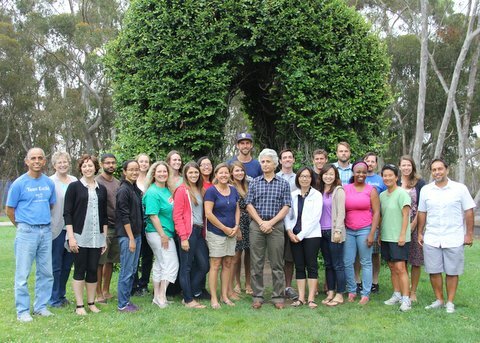 From June 30 to July 16 Math for America San Diego Fellows and Master Teaching Fellows participated in the program’s sixth annual summer institute, held this year at UC San Diego. This week, 34 high school teachers from Grossmont Union High School District will explore the mathematics of functions and inequalities as well as new teaching strategies in a one-week summer institute hosted by their district. Math for America San Diego, launched in 2008, is a consortium of three public universities: California State University San Marcos, San Diego State University and UC San Diego, and partners with five San Diego County school districts. The program supports a fellowship of exemplary new and experienced mathematics teachers who teach at area middle and high schools. MfA SD is the recipient of two National Science Foundation (NSF) Robert Noyce Teaching Fellowship grants. MfA SD is currently working with the CREATE STEM Success Initiative on several K-20 mathematics outreach projects, including development of a teacher leadership consortium and continued support of the Eleanor Roosevelt College/CREATE Math Tutor Corps program at UC San Diego, which resumes this fall.